However, not content with attacking ships and sailors, the corsairs also sometimes raided coastal settlements in Italy, France, Spain, Portugal, England, Ireland, and even as far away as the Netherlands and Iceland. They landed on unguarded beaches, and crept up on villages in the dark to capture their victims. Almost all the inhabitants of the village of Baltimore, in Ireland, were taken in this way in 1631. As a result of this threat, numerous coastal towns in the Mediterranean were almost completely abandoned by their inhabitants until the 19th century. Captured victims arrive on the Barbary coast to be sold as slaves. Image source. In the 13th and 14th centuries, it was Christian pirates, primarily from Catalonia and Sicily, that dominated the seas, posing a constant threat to merchants. 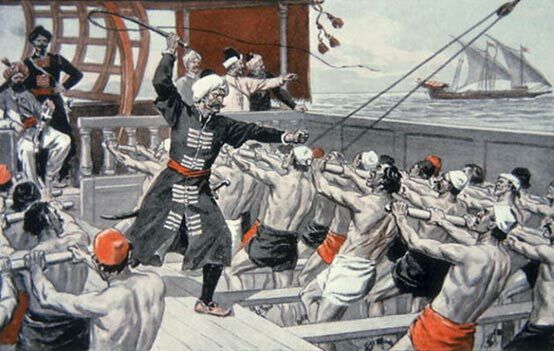 It was not until the expansion of the Ottoman Empire in the 15th century that the Barbary corsairs started to become a menace to Christian shipping. Around 1600 AD, European pirates brought advanced sailing and shipbuilding techniques to the Barbary Coast, which enabled the corsairs to extend their activities into the Atlantic Ocean, and the impact of Barbary raids peaked in the early to mid-17th century. While the Barbary slave trade is typically portrayed as Muslim corsairs capturing white Christian victims, this is far too simplistic. In reality, the corsairs were not concerned with the race or religious orientation of those they captured. Slaves in Barbary could be black, brown or white, Catholic, Protestant, Orthodox, Jewish or Muslim. And the corsairs were not only Muslim; English privateers and Dutch captains also exploited the changing loyalties of an era in which friends could become enemies and enemies friends with the stroke of a pen. "One of the things that both the public and many scholars have tended to take as given is that slavery was always racial in nature,” said historian Robert Davis, author of Christian Slaves, Muslim Masters: White Slavery in the Mediterranean, the Barbary Coast, and Italy. “But that is not true," he added. In comments which may stoke controversy, Davis claims that white slavery had been minimised or ignored because academics preferred to treat Europeans as evil colonialists rather than as victims. 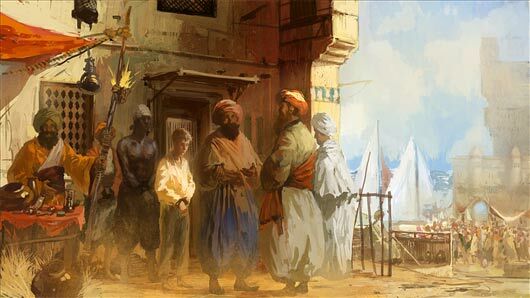 The Barbary slave trade is typically depicted as Muslims capturing white Christians, such as in the artwork above, but this is not entirely accurate. Image source. The slaves captured by the Barbary pirates faced a grim future. Many died on the ships during the long voyage back to North Africa due to disease or lack of food and water. Those who survived were taken to slave markets where they would stand for hours while buyers inspected them before they were sold at auction. After purchase, slaves would be put to work in various ways. Men were usually assigned to hard manual labour, such as working in quarries or heavy construction, while women were used for housework or in sexual servitude. At night the slaves were put into prisons called 'bagnios' that were often hot and overcrowded. However, by far the worst fate for a Barbary slave was being assigned to man the oars of galleys. Rowers were shackled where they sat, and never allowed to leave. Sleeping, eating, defecation and urination took place at the seat. Overseers would crack the whip over the bare backs of any slaves considered not to be working hard enough. Galley Slaves of the Barbary Corsairs. Image source. Corsair activity began to diminish in the latter part of the 17th century, as the more powerful European navies started to force the pirates to cease attacking their shipping. However, it wasn’t until the first years of the 19th century, that the United States of America and some European nations began to fight back more fervently against the Barbary pirates. Algiers was frequently bombarded by the French, Spanish and Americans, in the early 19th century. Eventually, after an Anglo-Dutch raid in 1816 on Algiers, the corsairs were forced to agree to terms which included a cessation of the practice of enslaving Christians, although slave trading of non-Europeans was allowed to continue. 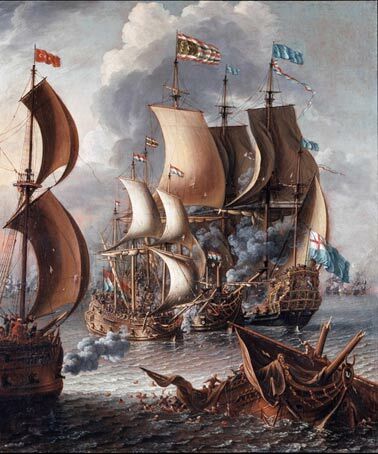 A Sea Fight with Barbary Corsairs, c. 1681. Image source. Occasional incidents continued to occur until another British raid on Algiers in 1824, and finally, a French invasion of Algiers in 1830, which placed it under colonial rule. Tunis was similarly invaded by France in 1881. Tripoli returned to direct Ottoman control in 1835, before finally falling into Italian hands in the 1911 Italo-Turkish War. The slave trade finally ceased on the Barbary coast when European governments passed laws granting emancipation to slaves. Featured image: A slave caught by Barbary pirates. Image source. Historians are trying to whitewash the entire history of the Barbary Coast and what happened there in past centuries. The majority of the slavers were Muslim. The majority of the slave owners were Muslim. The majority of the slaves were NOT originally Muslim. Hundreds of thousands were forcibly converted after they were captured which can add to the image that there were Muslim slaves who were captured as Muslims. Any research that refutes the fact that it was primarily Muslims who captured, sold and owned slaves is ignoring hundreds of years of history for the sake of political correctness. Research that looks at the truth should not be considered racist as Islam is not a race, but an ideology. ...and echoes of my thoughts. I also find it very "convenient" that the author only lightly brushes upon the fact that Africans were sold as slaves and then moves on - no further information is provided (yet more ignoring facts for the sake of sugarcoating). What the author very conveniently *forgot* to mention is it was actually other Africans who sold their fellow countrymen into slavery - generally tribesmen captured during battle and or raids. So basically, blacks sold blacks to _others_...not just whites. Slavery is a very old tradition, at least that fact wasn't conveniently *forgotten*, and is responsible for some of the greatest achievements in history. The Roman aqueducts, the Egyptian pyramids, and countless other creations, are the direct result of slave labor. People seem to forget this and focus, instead, on the "horrors" of only the slavery of blacks over about two hundred years instead of the entire history of more than 4,000 years of slavery. And let's be fair about this, slavery wasn't always such a bad thing. In both Egypt and Rome, slaves were actually treated quite well if they behaved. They were provided food, shelter, clothing and protection in return for them service. Additionally, in ancient Greece, a slave could actually work his or her way out of servitude and become a property, and even business, owner. In fact, the Greeks had a far different view of slaves and slavery. You weren't automatically a lesser person just because you were a slave. And capitol crimes such as murder were handled differently. If a person murdered another, the murderer was sentenced to seven years of indentured servitude to the family of the victim. This isn't to say that the murderer might not meet with an untimely demise, but slavery, in general, has had a very long existence and encompassed a multitude of both cultures and races. It would be a welcome breath of fresh air if people could actually focus on the *entire* history of slavery, instead of the convenience of one small chunk of time that suits their agenda, as well as stop demanding, expecting and clamoring for restitution from the descendants of slave owners who have never actually wronged the descendants of slaves. It was not 'convenient' to lightly touch on the African slave trade, it was intentional. This article was written to focus on one specific aspect of slave history, one that is lesser known. The African slave trade is another whole subject altogether and requires an article of its own. Yes, the subject was intentionally avoided. The last thing the author, or anyone interested in obfuscating the truth, wants anyone else to know is that blacks sold blacks into slavery. It wasn't whites who went to Africa and 'took them from their homes.' It's called "history." And like it or not, it's also the truth. As I previously said, the article was not about black slavery. If you think this article is about "obfuscating the truth", you must be new around here and not realize what we are all about.